Christian, a German friend of mine absolutely adores the Gouda Cheese. When I visit him in the morning, he offers me these little sandwiches with cheese. In the afternoon, there are cheese straws and mini kaassouflés with a glass of wine or beer. Dinners start and end with a big cheese platter with some mustard on the side and if he’s in a real good mood he’ll prepare a Gouda Cheese fondue. Cheese farmers from the region come to the Cheese Capital to sell their different types of Cheese Gouda. He told me he has not always been a fan of Gouda cheese or cheese in general. He came across this video on internet. It inspired him to visit Holland and find out more about cheese. 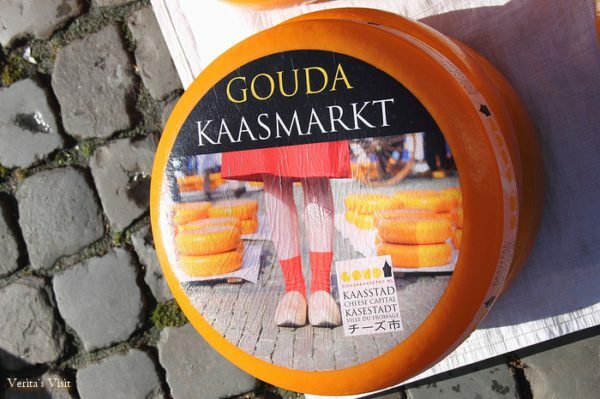 It was only after this trip to Gouda region that he started appreciating cheese. In the Dutch supermarket, in the small cheese shops and on the open air market he saw all these varieties of cheese, but didn’t really understand the difference between them. On the Thursday cheese market in Gouda Cheese Capital he approached a cheese seller. Christian asked him where all this cheese that he saw here was produced. The seller smiled an enigmatic smile and handed him a note. On the note were a couple of addresses in the area of Gouda. Curious to find out where it would lead to, Christian rented a bike and made a round past a couple of cheese farms. In one he did a cheese tasting and here he learned a few things about the 7 age types of Gouda cheese that he was eager to share with me. Graskaas is one of the lightest and smoother Gouda cheeses. It is made of the first milk the cows give when they’re back grazing in the fields after a long winter. Shortly after the production the cheese can already be consumed. There are people who are quite fanatic about this type of cheese. In an article by the Dutch newspaper AD it is said that for some, graskaas is even a bit like the Hollandse Nieuwe, the Dutch new herring. They can’t wait to try the graskaas of the new season. The young Cheese, jonge kaas, is a cheese that has ripened around 4 weeks. If you want to buy this cheese, look out for a red, yellow or orange wax rind. The young Gouda is a soft cheese with a mild, light nutty taste. Sometimes the cheese farmers mix spices in them. Cumin cheese is quite a popular cheese. The Young matured, jong belegen, has an age of 8 to 10 week, the matured, belegen, an age of 16 to 18 weeks. All these younger cheeses can be nicely cut with a slicer. Just like wine, cheese gets a more powerful taste when it’s older. In other words, age does matter. The longer it has ripened, the more distinctive the taste becomes. The cheese itself becomes harder, saltier and more crumbly. It has a golden interior. Some say they taste fruity or remind them of caramel. Older cheeses cut in cubes and presented on a platter together with a bit of mustard are lovely. Red wines and dark beers go great with older cheeses. Small scale cheese making is demonstrated in the cheese market in Gouda. But, isn’t it more interesting to see the real thing on a cheese farm? A cheese is called old after 6 months of ripening. There’s an extra matured, extra belegen of 7 to 8 months, an aged cheese, oude kaas of 10-12 months and the very old cheese, overjarig, of 1 year and older. You can recognise an older cheese by its black wax coating. After Christian’s explanation I’m eager to find out if I’m able to distinguish the all the 7 age types of cheese Gouda. And you? “Would you like to try out different cheeses and make your own cheese in a cheese farm”? There’s a little spark inside me and I nodd my head. He makes a phone call, arranges a bike and….